The 32,035 hectare, Kokanee Glacier Park is a rugged wilderness area of the Selkirk Mountains between Slocan and Kootenay Lakes, near the communities of Nelson and Slocan. Established in 1922, this park is one of the oldest in the province. Lying mostly above 1,800 metres (5,940 ft) in elevation, the park has three glaciers: Kokanee, Caribou and Woodbury which feed over 30 lakes and are the headwaters of many creeks. Kokanee Lake is 1,200 metres (3,960 ft) in length, 400 metres (1,320 ft) wide, probably 100 metres (330 ft) deep and surrounded by precipitous cliffs and rock slides. Other scenic lakes include the gem-coloured, Sapphire Lake, the milky Joker Lake and popular Gibson, Kaslo and Tanal Lakes which offer good fishing for Rainbow and Cutthrout trout. Geologically, this area is composed of an immense system of granite rock known as the Nelson batholith. During the earth's cooling process, slower cooling mineralized solutions were pushed by great pressure to fill holes and cracks in the granite. These became the deposits and finger-like veins, rich in gold and silver ore, that caused the local mining boom at the end of the nineteenth century. Several mines paid quite well but most were worked for only a few years. Many of the park's trails were originally built for miners hauling ore and supplies. Today we can marvel at the tenacity of those prospectors clinging to steep rock faces throughout the park while trying to scratch a living from their mining claim. Vegetation is typical of this elevation, with exposed bedrock and gravel moraine near the peaks where only lichens and few other plants survive. Scrub spruce is common at timberline with beautiful sub-alpine flower meadows in the wetter areas. The numerous steep slopes and avalanche paths support slide alder and huckleberry. The lower, more protected slopes are forested with Engelmann spruce, alpine, fir, lodgepole pine, hemlock and western red cedar. The few pure stands of alpine larch are particularly stunning in October when their needles turn golden-yellow in the fading sun. Bird species, such as the Blue and Franklin grouse inhabit the forests and ptarmigan are often seen in the open areas. Occasionally, Golden eagles are seen soaring majestically overhead. Small animals such as the Hoary marmot, pika, ground squirrels and marten are common while larger species such as mountain goat, mule deer and black bear are present in lesser numbers. The park contains most of the range for several grizzly bears and further protection of significant grizzly bear habitat was the main reason for the expansion of the park in 1995. Separation of people and grizzly bears for the safety of both is an important management objective. To protect the bear, areas such as the Coffee Creek drainage have no development and use is discouraged. Other trails are carefully designed to avoid bear habitat or closed annually when bears are known to be feeding on ripe berries nearby. 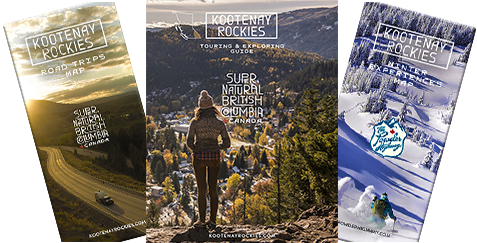 How to get to Kokanee Glacier Park: There are five access roads leading to the start of trails into the central area of the park. These roads may not be suitable for low clearance vehicles. 1) From Hwy 3A, 19 kilometres (12 mi) northeast of Nelson, drive up Kokanee Creek for 16 kilometres (10 mi) to Gibson Lake. 2) From Hwy 31, 10 kilometres (6 mi) north of Ainsworth, drive up Woodbury Creek for 13 kilometres (8 mi) to the trailhead. 3) From Hwy 31A, 6 kilometres (4 mi) northwest of Kaslo, drive up Keen Creek for 24 km to the Joker millsite. 4) From Hwy 6, 14.4 kilometre (9 mi) north of Slocan City, drive up Enterprise Creek for 13 kilometre (8 mi) to the trailhead. 5) From Hwy 6, 8 kilometre (5 mi) south of Slocan, drive up Lemon Creek for 16 kilometre (10 mi) to the trailhead. It is recommended for overnight stays that you surround your vehicle with chicken wire to protect it from porcupines which like to chew on rubber. Camping and Cabins in Kokanee Glacier Park: There is a fee for camping and cabin use in Kokanee Glacier Park. Three cabins are available on a first come, first served basis: Kokanee Glacier(sleeps 20, 12 in winter), Woodbury (sleeps 8) and Silver Spray (sleeps 10). You must be prepared to camp out if the cabin is full. Reservations for the three cabins can be made in advance for summer only (30-days prior to your arrival date) through the Alpine Club of Canada. And if you are a member of the Alpine Club of Canada, reservations during the summer months, can be made in advance (from 60 days to year in-advance, based on your type of membership). Gibson Lake to Slocan Chief Cabin Trail: Turn off Hwy 3A at Kokanee Creek Park, 19 kilometres (12 mi) north of Nelson and follow the gravel road for 16 kilometres (10 mi) to the parking area at Gibson Lake. Fires and pets are not allowed. Trailhead elevation 1,536 metres (5,069 ft). Picnic tables, pit toilets, day-use shelter. Gibson Lake to Kokanee Lake: Moderate, 4 kilometres (2.5 mi), 2 hr, elevation gain 445 metres (1,468 ft). Fishing, scenic views, watch for marmots and pikas along the side of Kokanee Lake. Kokanee Lake to Kaslo Lake: Easy, 3 kilometres (2 mi), 1.5 hr, elevation gain/loss 40 m/100 metres (132 ft/330 feet). Fishing in Keen, Garland and Kaslo Lakes, alpine meadows, 8 tent pads, pit toilet, bear proof food cache, grey water pit. Fragile area, stay on trails, camp only on constructed tent pads. Kaslo Lake to Slocan Chief Cabin: Moderate, 2 kilometre (1 mi), 1 hour, elevation gain 105 metres (346 ft) . Glacier views, historic cabin, 11 tent pads, pit toilet, bear-proof food cache. Fragile area, stay on trails, camp only on constructed tent pads. Several peaks and traverse routes can be reached from the Slocan Chief area. They are for experts with appropriate mountaineering skills and equipment only. There are no facilities, the terrain is often dangerous and many areas are prime grizzly bear habitat. Gibson Lake Loop Trail: Turn off Hwy 3A at Kokanee Creek Park, 19 kilometres (12 mi) north of Nelson and follow the gravel road for 16 kilometres (10 mi) to the parking area at Gibson Lake. Fires and pets are not allowed. Trailhead elevation 1,536 metres (5,068 ft). Picnic tables, pit toilet, day use shelter. Easy, 2.5 kilometre (1.5 mi), 1 hour (return), no elevation change. Nice views of surrounding peaks and old mine workings, flowers in season and subalpine vegetation, good fishing. Enterprise Creek to Slocan Chief Cabin Trail: Turn off Hwy 6, 14.4 kilometres (9 mi) north of Slocan City. Follow the logging road for 13 kilometres (43 mi) and continue on straight ahead at the forks (don't cross the creek) for a short distance to the park boundary and trailhead. Fires and pets are not allowed. Trailhead elevation 1,340 metres (4,422 ft). Enterprise Creek to Tanal Lake: Moderate, 6.4 kilometres (4 mi), 3 hour, elevation gain 409 metres (1,349 ft). Good fishing. Tanal Lake to Kaslo Lake: Moderate, 2.5 kilometres (1.5 m), 1.5 hour, elevation gain/loss 245 m/107 metres (808 ft/353 feet). Good fishing, views of Kokanee Glacier, 8 tent pads, outhouse, bear proof food cache, grey water pit. Kaslo Lake (north end) to Slocan Chief Cabin: Moderate, 1.3 kilometre (.8 mi), .5 hr, elevation change 105 metres (346 ft). Glacier views, historic cabin, 11 tent pads, outhouse, bear proof food cache. Fragile area, stay on trails, camp only on constructed tent pads. Enterprise Creek to Blue Grouse Basin Trail: Turn off Hwy 6, 14.4 kilometres (9 mi) north of Slocan City. Follow the logging road for 13 kilometres (8 mi) and continue on straight ahead at the forks (don't cross the creek) for a short distance to the park boundary and trailhead. Fires and pets are not allowed. Trailhead elevation 1,340 metres (4,422 ft). Moderate, 6.4 kilometres (4 mi), 4 hour, elevation gain 760 metres (2,508 ft). Avalanche paths, flower meadows, accessible peaks. There are no facilities so hike and camp in a manner which minimizes impact on vegetation and wildlife. Joker Millsite to Slocan Chief Cabin Trail: Turn off Hwy 31A, 6 km northwest of Kaslo. Follow gravel road for 24 kilometres (15 mi) to the trailhead. Fires and pets are not allowed. Elevation 1,448 metres (4,778 ft). Note: this trail is closed during berry season (mid August to early October) to allow grizzly bears to feed. Moderate, 5 kilometres (3 mi), 3 hour, elevation gain 540 metres (1,782 ft). This steep trail is the shortest route to the central core of the park. Good fishing in Helen Deane Lake. Glacier views, historic cabin, 11 tent pads, outhouse, bear proof food cache. Fragile area, stay on trails, camp only on constructed tent pads. Joker Millsite to Joker Lakes Trail: Turn off Hwy 31A, 6 kilometres (4 mi) northwest of Kaslo. Follow gravel road for 24 kilometres (15 mi) to the trailhead. Fires and pets are not allowed. Elevation 1,448 metres (4,778 ft). Moderate, 5 kilometres (3 mi), 3 hour, elevation gain 452 metres (1,491 ft). Impressive view of Bridal veil cascade. One of the two lakes is usually a clouded turquoise colour due to glacial silt while the other is crystal clear. Good fishing. There are no facilities, so hike and camp in a manner which minimizes impact on vegetation and wildlife. Woodbury Creek to Woodbury Cabin Trail: Turn off Hwy 31, 10 kilometres (6 mi) north of Ainsworth. Follow the logging road for 13.2 kilometres (8 mi) to the trailhead. Fires and pets are not allowed except at trailhead. Moderate, 9 kilometres (6 mi), 4.5 hour, elevation gain 762 metres (2,514 ft). Scenic views, Wolf cascade, excellent glacier views, good cabin sleeps 6, tenting area, outhouse. Woodbury Creek to Silver Spray Cabin Trail: Turn off Hwy 31, 10 km north of Ainsworth. Follow the logging road for 13.2 km to the trailhead. Fires and pets are not allowed except at trailhead. Moderate/difficult, 8 km, 5 hr, elevation gain 1,016 m. Mining history, flower meadows, new cabin sleeps 8, tenting area, outhouse. Woodbury Creek to Sunset Lake Trail: Turn off Hwy 31, 10 kilometres (6 mi) north of Ainsworth. Follow the logging road for 12.2 kilometres (7 mi) to the trailhead. Hike or drive (when possible) up the old Sranton Mine Road for about 1 kilometre (.6 mi). Fires and pets are not allowed. Easy, 3 kilometre (2 mi), 1.5 hour, elevation gain 193 metres (637 ft). Good fishing and views of surrounding peaks. Lemon Creek to Slocan Chief Cabin Trail: Turn off Hwy 6, 8 kilometres (5 mi) south of Slocan City. Follow the signs on the logging road for 16 kilometres (10 mi) to the trailhead. Fires and pets are not allowed. Trailhead elevation 1,250 metres (4,125 ft). Lemon Creek to Sapphire Lakes: Moderate, 9.8 kilometres (6 mi), 5 hour, elevation gain 950 metres (3,135 ft). Hike on old mining trail, old growth forest, waterfalls, old mine cabin. Trail may not be maintained or obvious in some sections. Food cache and toilet at east end of lake. Sapphire Lakes, Lemon Pass, Kaslo Lake to Slocan Chief Cabin: Moderate, 4.5 kilometres (3 mi), 2.5 hour, elevation loss/gain 320 m/105 metres (1,056 ft/ 346 feet). Glacier views, historic cabin (100 years old in 1996), 16 tent pads, outhouse, bear proof food cache. Winter Activities: The Slocan Chief and Silver Spay cabins are available for winter use by reservation only. A lottery for reservations is held in mid-October for the upcoming winter. Air Access: There is no air access into the Kokanee Glacier Provincial Park. In the Selkirk Mountains between Slocan and Kootenay Lakes.